Actually, ability to work with the file system during SQL Injection exploitation represents a step towards the ability to execute commands on server. This is why SQL Injection vulnerabilities belong to the class of "Command Execution" in standard terminology. 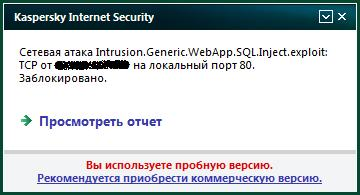 However, sometimes it is impossible to influence the data returned by the application during conduction of an SQL Injection attack. In these cases, the vulnerability is called blind. It should be mentioned that this is the technique of Blind SQL Injection exploitation that allows one to bypass most filters (including WAFs) easily. If the table "users" contains a column "pass" and the first symbol of the first entry from this column is 97 (symbol "a"), then MySQL will return TRUE and the query will be true. Otherwise, it will return FALSE and the page will display "error" for the code given above. Thus, if the table "users" contains a column "pass" and the first symbol of the first entry from this column is 0, then MySQL will return an error message "#1139 - Got error 'invalid repetition count(s)' from regexp". If the first symbol in the column "pass" is 1, then an error message "#1139 - Got error 'braces not balanced' from regexp" will be received, etc. With this method, one can get up to 64 bytes of useful data using one query to the web application! Functions of string concatenation concat() and concat_ws() allow one to make an effective and quick dump of the whole table. Unfortunately, the given ruse with the function name_const() will give results only for MySQL versions 5.0.12>5.0.64. 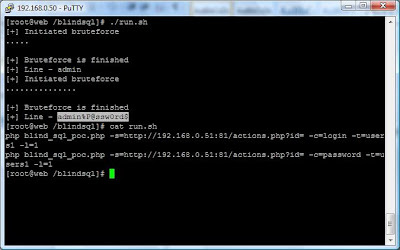 Thus, we can read data from the table using Blind SQL Injection exploitation (MySQL v. 5.1.5 and later) and having a restriction of 31 useful bytes per one query to the web application. The "XPATH syntax error" is related to incorrect regular expression "\\". Note: when the article was published, Qwazar offered the more interesting method to exploit Blind SQL Injection to which all MySQL versions later than 4.1.x. are affected. Unfortunately, all described methods can be applied only if MySQL error messages are placed into the body of the returned page, which isn't always true. Well, what of that? Do we have to use tedious techniques of symbol-by-symbol search again? Not always! It should be mentioned that in this method, the length of HTTP request cannot be more than 8192 bytes. In other respects, the method is rather effective when MySQL error messages are not displayed in the returned page. In addition, the method is universal and doesn’t depend on the database being used. Proof of concept code is here. Sometimes not only all error messages are excluded from the page returned by the web application, but the vulnerable query itself is used only for certain internal purposes. For example, it can serve for some event logging or internal optimization. 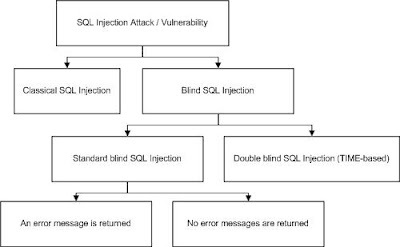 These SQL Injection vulnerabilities belong to the Double Blind class. Exploitation of this group of SQL Injections is based on analysis of time delays from the moment of sending a query to the web application till the moment of receiving the answer from it. In classical approach, the function benchmark() is applied. However, the function sleep() represents a better and more secure alternative, because it doesn’t use processor resources of server as the function benchmark() does. Here is an example of a simple implementation of symbol-by-symbol search based on analysis of time delays. As one can see, alphabetical order is used in the array $b_srt to find data. The script sequentially checks every symbol from the array for coincidence with a symbol from the database. One can speed up the process by arranging the symbols in a more favourable order or using a binary tree. It should be mentioned that application of binary trees requires use of symbols ">" and "<", which is not always possible, because these symbols are often converted to HTML equivalents. As for favourable searching order, d0znp can be found in the Hacker in December 2009 (the Russian magazine), and soon it can be found in white papers at milw0rm.com in English.